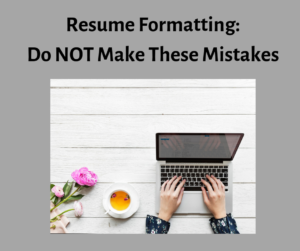 Because I typically work with clients who haven’t written or needed a new resume in 15-20 years, their previous documents tend to be formatted in a way that they learned in high school or college. When they send me their documents, I often discover that, in addition to containing older information, the document also has formatting that may be from 1995 or (gasp!) even 1985. If you are someone who is updating a resume for TODAY’S job market, read on to ensure you don’t make these resume mistakes. #1 – Don’t use an out-of-date font. Do you remember when Times New Roman or Courier were popular fonts? Well, they aren’t anymore. In fact, studies have shown that sans serif fonts (those without the tiny feet) are much easier for people to read. Personally, I prefer Calibri – it’s the default font in Word and simple. In addition, if you Google it, you will find that Times New Roman is sometimes viewed as an “old” font—don’t use it for your resume. #2 – Do NOT use text boxes and a LOT of graphics. It is perfectly fine to bring a graphic-related resume to the job interview and it does look nice. However, if you are sending resumes via websites, then you need to ensure your document is Applicant Tracking System-friendly. Simplicity is the key. Sometimes those charts, text boxes, and graphics just don’t translate well through those systems. #3 – Don’t go over two pages. If you ask one person, he or she may say that you HAVE to have a one-page resume. Someone else may say two-pages is fine. My general rule-of-thumb is that if you have more than 10 years of experience, then two-pages is acceptable. If you are a recent college graduate, then one-page should summarize your experience. Anything over two pages isn’t even being read and means that you are including TOO MUCH information that isn’t relevant to your job search. #4 – Have variations of files. Most online systems will ask for a Word document or a PDF. Follow those directions. Don’t make your resume in Photoshop, Illustrator, or Canva and then expect that the system will allow you to upload that type of file. Again, the simpler programs tend to work best. It’s also a good idea to have a text-based file, too. #5 – Only include the necessary sections. Those sections are a career summary, skills area, professional experience, education, and community engagement (if any). Today’s resumes do NOT need an objective, hobbies, or other personal data. Again, keep it relative to work and how you can help the company. If you are still unsure of formatting, content, or which information to include on your new resume, contact me today for a free resume review – I’d love to help you get one step closer to your next job opportunity!